Anaele Pelisson/Business Insider; Getty Images; Shutterstock; SpaceXElon Musk wants to colonize Mars with SpaceX. Elon Musk, the founder of SpaceX, has unveiled a new design for a 100% reusable rocket and spaceship to colonise Mars. SpaceX has experience building traditional life support systems for its Crew Dragon capsule, a spaceship built for NASA. But independent spaceflight experts say technologies that don’t yet exist are necessary to keep Martian colonists alive. Musk and SpaceX have yet to detail exactly how hypothetical Mars explorers and colonists will survive. At a spaceflight conference in Australia on Friday, Elon Musk unveiled an audacious new plan to build giant reusable spaceships and colonize Mars with them. Industry experts are excited by Musk’s vision to back up the human race by putting 1 million people on a new planet, but many have practical questions for the tech billionaire and founder of SpaceX. Above all, they’re eager to know how Musk plans to keep people alive on Mars for months or years on end. Musk’s latest talk at the International Astronautical Congress 2017 in Adelaide updated a roughly one-hour presentation that he gave at the same event in September 2016. 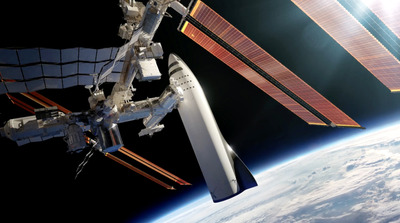 SpaceX/YouTubeAn illustration of Elon Musk and SpaceX’s ‘Big F—ing Rocket’ (white vessel, center) docked to the International Space Station. 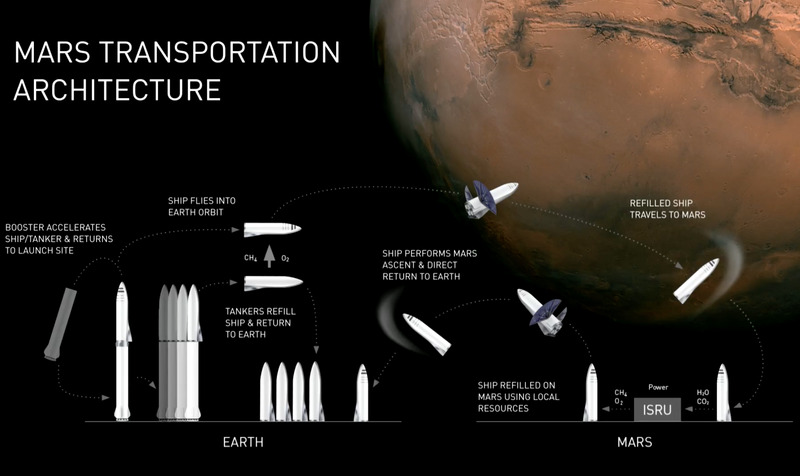 Musk first unveiled his Mars vehicle design — which he used to call the “Interplanetary Transport System” but now calls the “Big F—ing Rocket” (BFR for short) — during IAC 2016. The original rocket-and-spaceship vehicle was supposed to tower 400 feet, or slightly higher than a Saturn V moon rocket. It was designed to bring up to 300 tons of spaceship cargo — about two blue whales’ worth of mass — into orbit around Earth. Musk’s latest BFR design is about 50 feet shorter, and its spaceship is supposed to carry about half the payload. SpaceX has already built and tested key pieces of hardware in hopes of launching its first mission to Mars in 2022. 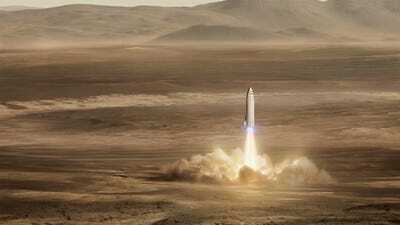 Musk hopes to fly four additional ships to Mars in 2024, including two cargo missions and two ships carrying the first Martian explorers. From there, an increasing number of missions could establish and grow a colony. “You can do it, Elon!” a man shouted from his seat after hearing these details at the conference. Some spaceflight engineers and experts, however, are questioning whether he can. According to Musk’s new plan, two uncrewed missions would pave the way for future human exploration of Mars. The first would locate sources of water in the soil, and the second would set up a chemical factory to turn that water, plus carbon dioxide in the thin Martian air, into oxygen and methane rocket fuel. After the first people land on Mars, regular cargo launches would resupply them with food and other essentials. D. Marshall Porterfield, the former director of NASA’s Space Life and Physical Sciences Division, said SpaceX’s reusable rocket technologies are “a huge game-changer” in terms of lowering steep launch costs and enabling such missions. “He totally changed the economics,” Porterfield, now a professor at Purdue University, told Business Insider during the university’s “Dawn or Doom” conference before Musk’s latest talk. For example, SpaceX’s Falcon 9 and upcoming Falcon Heavy rockets can reuse their boosters. These enormous parts represent about 70% of the rockets’ cost, and by not throwing them away after every launch — the standard industry practice — the savings add up quickly. A fully reusable rocket and spaceship, as Musk is proposing with the BFR, would compound the savings and open access to space even further by lowering costs 100- or even 1,000-fold, according to Musk. “We could assemble space exploration capabilities in orbit [around Earth] and launch a mission to Mars from there,” Porterfield said, adding that the first crewed Martian missions will be like “vacations” compared to the “camping trips” of the Apollo program. “The scenario in ‘The Martian’ is completely doable,” he said, referencing the sci-fi book and movie in which a NASA astronaut is accidentally stranded at a Martian outpost. 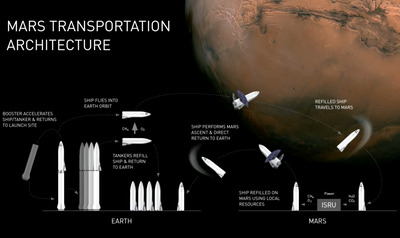 SpaceX/MarsA graphic showing SpaceX’s basic plan to begin colonizing Mars. Indeed, SpaceX may have the expertise it needs to get the first explorers to Mars and back alive. 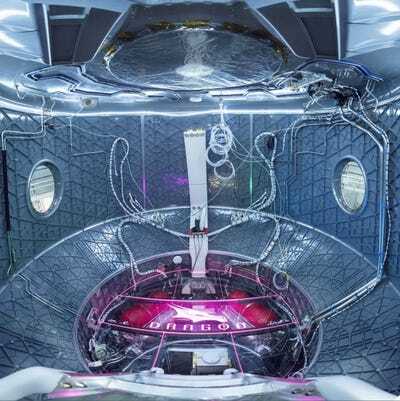 The company already built the environmental control and life support system, or ECLSS, that keeps astronauts alive and comfortable on its Crew Dragon spacecraft. NASA is counting on Dragon to ferry its astronauts to and from the International Space Station starting in 2018. (Russia’s Soyuz spacecraft is current the only ride to orbit — and it’s recently quadrupled ticket prices.) SpaceX is even pondering a privately funded mission around the moon using Dragon and ECLSS. In his IAC talks, Reddit chats, and other public statements, however, Musk has not detailed how SpaceX will keep the first Martian explorers alive. SpaceXSpaceX’s environmental control and life support system, or ECLSS, inside the company’s Crew Dragon space capsule. When Business Insider contacted SpaceX for more details about these plans, a spokesperson responded by emailing several of Musk’s prior statements. 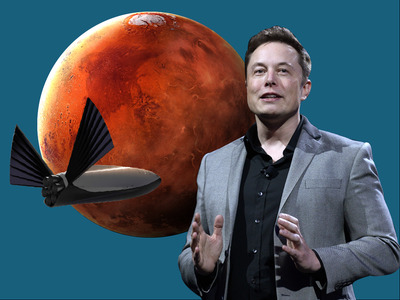 One came from his IAC 2016 talk, when he compared Mars to California in the early US, and said SpaceX is trying to build the Union Pacific Railroad. 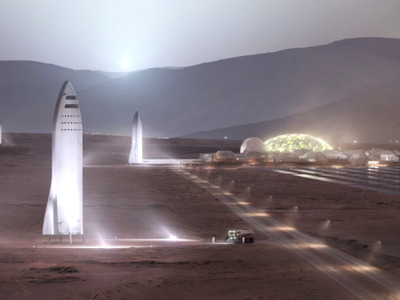 “Once that transport system is built, then there’s a tremendous opportunity for anyone who wants to go to Mars and create something new or build the foundations of a new planet,” Musk said at the time. Musk also said he expects SpaceX’s Mars effort “to be a huge public-private partnership,” and that the company is “trying to make as much progress as we can with the resources that we have available.” He added that he hopes his plans spur companies to develop their own competing and innovative approaches, and that colonizing Mars — no matter who gets the job done — is his goal. SpaceX declined to answer specific questions about whether employees are working on long-term life support systems for Mars, whether Musk thinks such systems will emerge from outside the company, and when Musk plans to release details about such systems. Porterfield believes the company needs systems that currently do not exist. “His idea about colonizing? That’s going to require … bioregenerative life support capabilities,” he said. The idea behind bioregenerative life support, which Porterfield worked on at NASA, is to collect a human crew’s breath, liquid waste, and solid waste — then use plants and other life forms to recycle it into food, water, and air. This would reduce the need for resupply missions and help ensure a crew’s long-term survival. It would also make a colony vastly more sustainable, affordable, and independent. Spacecraft today don’t rely on bioregeneration to keep people alive. Instead, they use traditional life support systems — pumps, filters, compressors, chemicals, and the like. SpaceX’s ECLSS is one such system. Research into these traditional systems flourished during the Cold War, and more recent developments have turned out new capabilities. For instance, the space station recently got a new chemical-mechanical system that can recycle — with 93% efficiency — an astronaut’s urine, evaporated sweat, and breath into drinking water. Research into biological life support systems also occurred during the Cold War, though to a far lesser extent — for example, one Soviet experiment used algae to generate oxygen inside sealed nuclear bunkers. Since then, a few experiments in orbit and on the ground have shown it’s possible to grow edible plants in space and in Martian soil. Yet Porterfield said “tremendous challenges” must be overcome before any biology-based technology can fully and reliably keeping people alive in deep space. In his talk at the “Dawn or Doom” conference, Porterfield brought up the Biosphere 2 experiment in Arizona as an example of the challenges. Eight people lived in the sealed, three-acre habitat for two years with a bounty of plants and animals — yet they quickly encountered problems severe enough to require outside help, including pumping in oxygen. 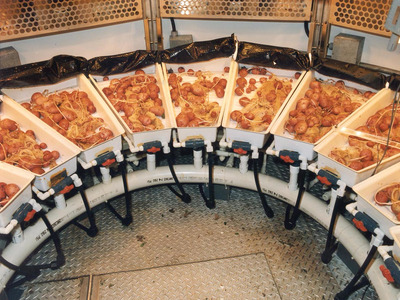 NASAPotatoes grown hydroponically in NASA’s Biomass Production Chamber experiment. A more compact and successful experiment was NASA’s Biomass Production Chamber — a giant, sealed greenhouse built inside a hyperbaric chamber at the Kennedy Space Center. 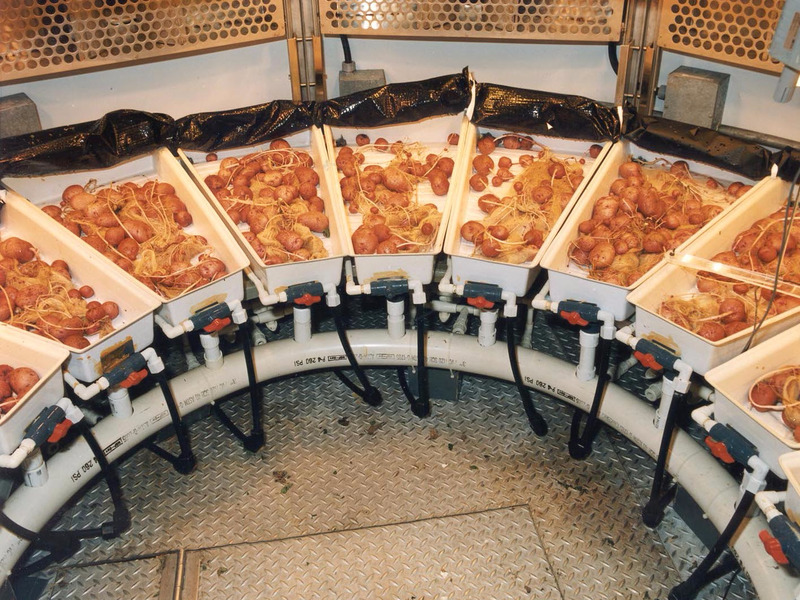 The chamber broke world records for food production with a variety of crops from the late 1980s through the early 2000s. But NASA’s space greenhouse was scrapped in the 2000s, along with other research into biological life support, due to congressional budget cuts. He added that China is poised to overtake the US in bioregeneration with its “Lunar Palace-1” experiment, which has sealed four students inside a habitat with plants and animals for a year. A few years ago, when Porterfield worked for NASA, he and some colleagues were invited to SpaceX. Musk pitched a flyby mission to Mars that would cost about $US600 million, and Porterfield and his colleagues were interested. Porterfield thought NASA higher-ups would bite, but they ultimately passed on SpaceX’s offer. “During that time, though, I learned they [SpaceX] really don’t have a science program, per se, that would enable them to really consider … bioregenerative or even just greenhouse-type of technologies in a Mars architecture,” Porterfield said. Logsdon offered a similarly sceptical assessment. Despite NASA’s budgetary de-emphasis on bioregenerative programs, Porterfield said he hasn’t noticed any staff migrations that suggest SpaceX might be acquiring expertise to research bioregenerative capabilities (though he noted he does not keep close tabs on SpaceX’s hiring efforts). Business Insider shared these and other comments with SpaceX, but a spokesperson declined to provide an on-the-record response. If Porterfield had a chance to ask Musk any questions about his Mars plan, he said he’d focus on life support. Disclosure: The author of this post was also a speaker at the “Dawn or Doom” conference.